This tasty high-protein snack just takes moments to prepare. For this recipe, make sure you use a white albacore tuna that has been troll caught. Trolling lines catch smaller tuna, protect dolphins, and allow fishermen to determine the size of the fish they keep. Because the level of mercury in fish is determined by the size of the fish, you want to eat the smallest fish you can. But don’t go as far as eating tiny shrimp-like krill — leave those for the whales! This recipe was developed by Michelle Gay. In a small bowl, mix together the tuna, almond meal, egg, salt, and pepper. Set aside. Heat the oil or ghee in frying pan over high heat. 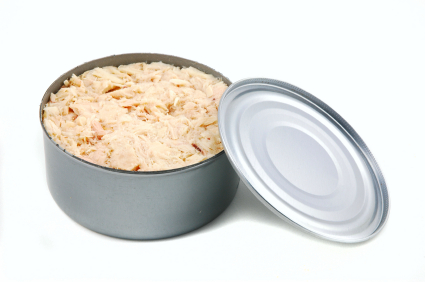 Work the tuna mix into little cakes and drop them into the frying pan. Cook on one side for 3 to 4 minutes and then flip over and cook for 3 minutes or until crispy brown. Per serving: Calories 396; Fat 23.6 g (Saturated 3.1 g); Cholesterol 275 mg; Sodium 986 mg; Carbohydrate 5.4 g (Fiber 2.6 g); Protein 43.8 g; Sugar 0.4 g.